On February 21, 2013, at 6:30, in front of the building of the Armenian Consulate in Los Angeles, there will be a protest against massive election fraud, which was carried out during the Armenian Presidential Election on February 18, 2013 and which has distorted the overall election outcome. 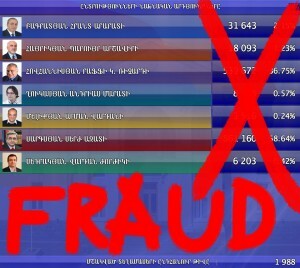 Until the consequences of election fraud are eliminated and the numbers published by the Central Electoral Commission inspire confidence, it is unacceptable to consider Serzh Sargsyan President-elect. With this protest, we demand that everybody engaged in voter fraud be punished, as well as call on all the Diaspora organizations and institutions to refrain from untimely congratulating Serzh Sargsyan on re-election.